Adam Cathcart at Sinologistical Violoncellist is exactly right, some American commentators and “journalists”, especially those who are right and conservative-leaning just don’t get it. Peter J Brown, a “satellite journalist”-turned China observer based in Maine is apparently one of them. So, add it all up and it looks like Obama put missiles aside and engaged China’s Communist Youth League instead. He was fuming because Obama, during his three-day visit to China that ended just a few hours ago, had enough time to challenge his Chinese hosts on this ultra-important issue ( to Peter J Brown China’s so-called military buildup is far more important than issues such as the recession, yuan, trade, climate change and Iran. ), but apparently he did not. Brown was just short of declaring Obama a traitor. Wow. China’s “military buildup”, particularly China’s missiles are a more pressing issue than climate change? You must be kidding. The mighty United States, with its far more superior arsenal in terms of both quality and quantity and its far greater power projection capabilities is whining about China’s “military buildup”? The likes of Peter J Brown must have forgotten that the US “defense” budget is fives times greater than China’s. The mighty United States, as the lone superpower and world hegemon whose global presence is looming large and extremely menacing for those who do not heed calls from Washington with a big nod, is asking China to explain its intentions? Does the US think that the rest of the world (its loyal allies excluded) assume that the American intentions are so benign that they don’t need to be explained? What has the world come to? I actually wish Obama had brought up this issue to President Hu. That way he would have received a firm “No way, no how” from the Chinese, just like how they have responded to the American pressure to devalue yuan. I guess I will never get certain people. How do people like Peter J Brown sleep at night? It must be the comforting thought knowing that we (the US) are the biggest, baddest, most powerful and most righteous nation on the face of the earth, chosen by God. Our enemies will crumble before us. 미국 만세, 만세, 만만세! By the way, I thought Obama’s visit to China went pretty well. It would be naive for anyone to expect Obama and Hu to work out any substantial deals. The goodwill fostered in this visit will go a long way and will prove to be very constructive for the two countries. 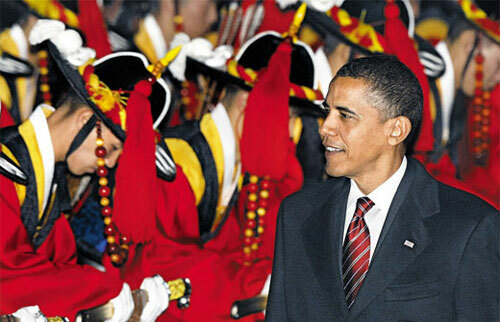 Next up we have Obama in South Korea. I doubt that there will be any major announcement with regard to the DPRK, the focus is on the FTA. Courtesy of Chosun Ilbo. Don't you just love the Yuan-inspired Chosun Dynasty 曳撒? A side note: Evan Osnos of the New Yorker Magazine interviewed Shi Yinhong on China’s position on Iran. Like a typical Chinese official/scholar, Shi was being very reserved by politely saying that China sees Iran differently, not that China doesn’t see where the US is coming from. I felt that Shi could have been a lot more open and frank about it: The US sees (nuclear) Iran as a grave threat to its interests in the Middle East and its BFF Israel therefore the US is for getting 100% tough with Iran. China on the other hand has vastly different interests with regard to Iran (oil! oil! oil!) and Israel is almost next to nothing on China’s radar. So naturally China’s position on Iran differs from that of the US. It should not be surprising to Obama and Osnos. Thanks for the endorsement, Juchechosunmanse.